Today Emme & I stopped by the Dublin launch party for the Hello Bezlo dress line. We browsed a gorgeous collection of dresses, learned a bit about CoderDojo's amazing coding community and we did some serious glitter crafting. All in all, a successful day for us! After a quick greeting with Clodagh Connell, the founder of Hello Bezlo, we went straight to the dress collection. The line is stylish, inspiring, original and wearable! The durable fabric would surely hold up on our toughest outdoor adventures. And I have never seen a dress designed with binary code before but Hello Bezlo discovered a way to make 1s and 0s look cool and chic. There's detachable tutus and capes too- perfect for everyday dress-up. A nurse by day, Clodagh was inspired to create this line of dresses when she was shopping for her niece. Finding rocket ships on clothes without entering the boys department was proving difficult. So what did this super aunty do? She found a designer to produce her ideas and introduced us to the Bezlo Girl, of course! A loving, ambitious, and determined aunt! We're impressed! I love Hello Bezlo's description of their girl. She's spirited. Adventurous. Fearless. 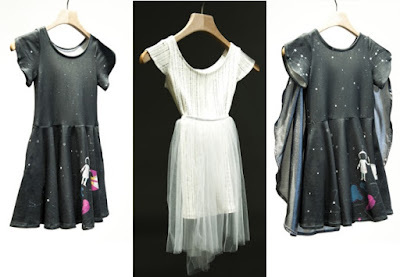 They're dresses for the girls who fall in that space just between the "super girly girl" and the "tomboy". I imagine the Bezlo Girl is very similar to my own daughter- an imaginative girl who wouldn't bat an eyelash as she rips her tights on a race through the woods with her pals. Check out Hello Bezlo's Kickstarter campaign here, and if you have a little girl aged 2-10 who dreams of becoming an astronaut while twirling in a pretty dress, then definitely consider funding this project. With just 5 days to go, our fingers are crossed for Hello Bezlo's success. We wish you the very best of luck during these final days and can't wait to see what else you have in store for us! Fantastic dresses, love the designs! They're gorgeous! So different & so inspiring!